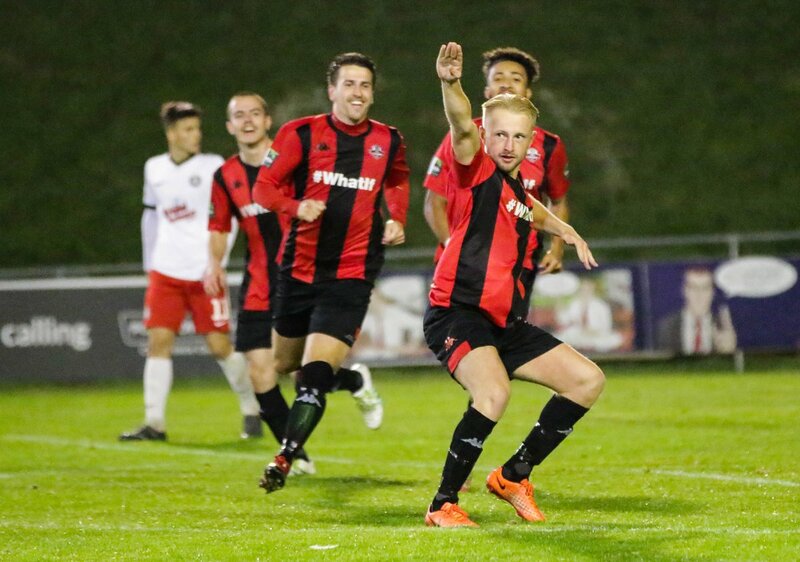 A hardworking team performance and goals from Jonte Smith and James Hammond helped Lewes progress to the third qualifying round of the FA Cup for the first time in five years with a hard-fought 2-1 victory over Kings Langley at the Pan, reports Tom Harper. With eight first-team players unavailable, Darren Freeman was forced into a reshuffle of the side, which saw Steve Brinkhurst partner Frankie Chappell at the heart of the defence, central midfielder Michael Dome-Bemwin fill in at right-back and development squad winger Sam Karl handed his first-team debut. The visitors made a bright start to the game and could have taken the lead twice inside the opening five minutes, as Rene Howe saw a close-range effort blocked before Steve Ward drew a fine save from Lewis Carey with a powerful strike at the end of an incisive passing move. Lewes were unsurprisingly finding it difficult to play their usual flowing football but grew into the game as the half progressed, with Dan Darbyshire shooting over the bar from the edge of the area after good hold-up play from Jonte Smith. The Rooks were doing their best to press high up the pitch and this nearly led to them taking the lead just before the half-hour mark, as Sam Karl intercepted a square ball across the back four and forced Martin Bennett into a smart stop at his near post. Lewes were handed a great chance to take the lead from the penalty spot after 33 minutes, as Bennett brought down Karl in the area after the young winger had beaten him to a Smith knockdown. Smith took the penalty, and waited for Bennett to dive to his left before calmly rolling the ball to his right to give the Rooks the lead. Lewes started the second half on the front foot and doubled their lead within four minutes of the restart, as a powerful James Hammond free-kick appeared to be misjudged by Bennett, with the goalkeeper only succeeding in helping the ball into the roof of the net. Kings Langley nearly responded immediately, with Carey having to react quickly to push a long-range Mitchell Weiss effort round the post after it hit a bobble right in front of him. From the resulting corner, Callum Adebiyi sent a thumping close-range header past Carey to bring the visitors back into the game just two minutes after going 2-0 down. Lewes always looked capable of scoring as the second half progressed, with Smith forcing Bennett into two fine saves in quick succession as the Rooks looked to regain their two-goal advantage. Smith was at the heart of all of Lewes' best attacks, and came close to doubling their lead and his own personal tally for the evening with a half-volley from just inside the area which flew narrowly wide of Bennett's near post. The visitors spent most of the final 15 minutes camped in and around the Lewes penalty area, and saw Howe send a volley on the turn just wide after the Rooks had been unable to fully clear a corner from the left. They came even closer to equalising minutes later through Max Ryan, whose powerful run ended with an effort from a tight angle which Carey was able to help onto the post before the ball was eventually put behind. From the resulting corner, the unmarked Jorell Johnson was only able to guide his close-range header over the bar. Their final chance came at the start of five minutes of injury time, as Roy Syla saw his long-range strike deflected just over the bar. Lewes saw out the remainder of the game more comfortably to record an impressive victory, and set up a trip National League South side Bath City in the third qualifying round next Saturday. Highlights from the game can be viewed here thanks to Your Instant Replay. Darren's post-match interview with Barry Collins can be seen here whilst you can still access last night's matchday programme here. The Rooks return to league action on Saturday when they visit Wingate & Finchley, kick-off at 3pm. Lewes: Carey, Redwood, Darbyshire (Medlock 89), N. Cotton, Chappell, Hammond, Dome-Bemwin, Smith, Lawson, Karl, Brinkhurst. Unused Subs: Headland, Barclay, Gifford, Parker, Tasker, L. Cotton. Booked: Redwood, N. Cotton, Hammond. Kings Langley: Bennett, Connolly (Syme 73), Adebiyi, Johnson, Ryan, Godfrey, Ward (Stobbs 86), Hitchcock (Collier 79), Howe, Weiss, Syla. Unused Subs: Tucker, Toiny-Pendred, Coldicott-Stevens.